This reference is intended to help people discover what is said in the Bible about any particular subject. The structure used is the same as the categories of Roget's Thesaurus, covering the whole spectrum of meaning. References are grouped on the basis of meaning rather than in alphabetical order. This means that references appear together independently of the way they are rendered in any particular translation of the Bible and even independent of the language used. 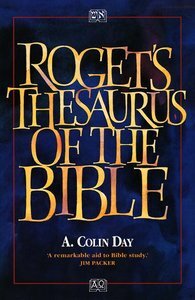 About "Roget's Thesaurus of the Bible"
Dr A Colin Day Ph.D. in General Linguistics (School of Oriental and African Studies, University of London) worked with Wycliffe Bible Translators / Summer Institute of Linguistics before coming to the Computer Centre, University College London, University of London where he was Head of Applications. Dr Day has used his computer expertise and Biblical knowledge to publish Collins Thesaurus of the Bible, HarperCollins, 2002. Collins Thematic Thesaurus of the Bible, HarperCollins, 2005 and Getting it Straight from the Bible, e-book, 2006.